This entry was posted in Uncategorized on July 12, 2011 by Shannon. This entry was posted in Uncategorized on July 10, 2011 by Shannon. Stylehive is a great newish site, that is social bookmarking for shopping. I use it regularly, and it’s great for when you’re browsing online and see something cool, but you don’t want to buy it right away. You can also share your lists with friends, and see what other people are tagging. I just use a stylehive bookmarklet and then I can tag whatever I want including it’s picture, price, and whatever tags I want to give it. The front page shows the most recently tagged things, and I’ve found some really cool stuff that I’ve saved there as well. Stylehive is also good for things like shopping for a gift, or saving things you don’t need right now (for me that’s often baby/kid stuff) but might want to find again later when you do need them, or say have a baby shower to go to. My top tag used on Stylehive is gadget followed by purse. I think that says alot about me. This entry was posted in Uncategorized and tagged web2.0 on October 6, 2006 by Shannon. Originally uploaded by CC Chapman. 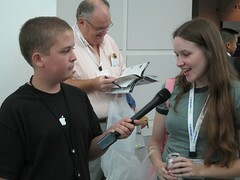 Finally, here I am getting interviewed by Robbie from the Teen Podcasters Network. I tell him about The Fangirl Podcast, and what I’m doing at the expo. 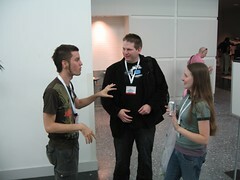 This entry was posted in Uncategorized and tagged podcast expo on October 1, 2006 by Shannon. Here I am at the Expo with Alysia, one of the PotterCast transcription elves. Often indecisive, you can’t even choose a favorite color. You’re apt to follow wherever the wind blows you, just like Calico Jack Rackham, your namesake. You can be a little bit unpredictable, but a pirate’s life is far from full of certainties, so that fits in pretty well. Arr! This entry was posted in Uncategorized and tagged memes, pirates, quizes on September 19, 2005 by Shannon.